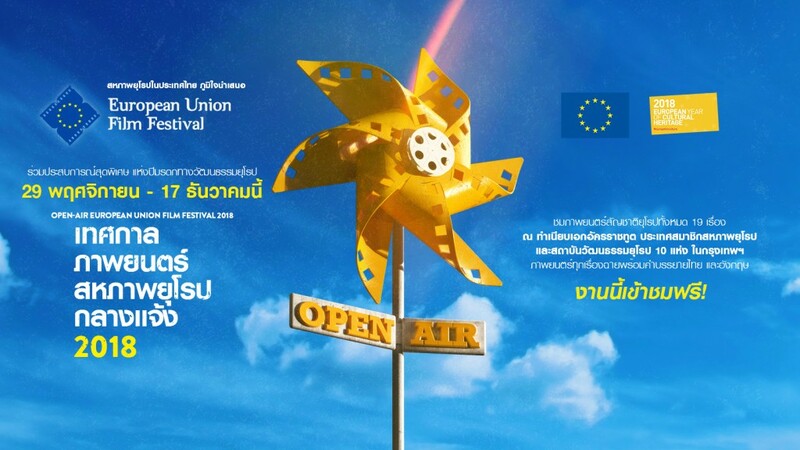 The 27th European Union Film Festival returns to Bangkok this year, presenting an open-air movie screening experience for the first time ever as the European Union celebrates the European Year of Cultural Heritage (EYCH) in 2018. The festival will feature 19 premium quality and award-winning films from 19 European Union Member States. 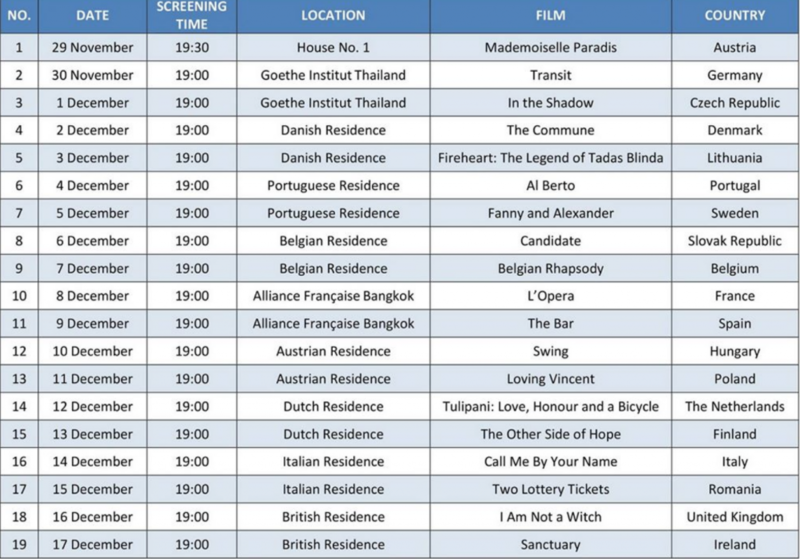 The 2018 edition will also offer a rare and unique opportunity for all audience as ten Residences of EU Member State Ambassadors and EU cultural institutes in Bangkok will open their doors for the screening of the films. The festival will officially kick off on 29 November at the House No. 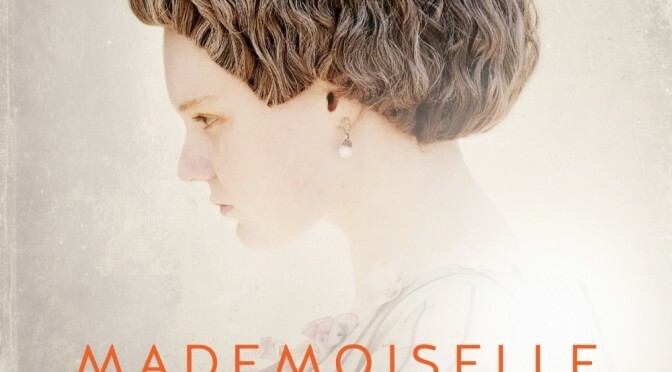 1, a historical house with European heritage located on Captain Bush Lane with the screening of Mademoiselle Paradis, a film from Austria portraying a blind pianist in the 18th-century Vienna who forms an extraordinary relationship with the physician who is trying to restore her sight. The European Union Film Festival 2018 runs from 29 November to 17 December where 19 premium quality and award-winning films will be screened at ten European heritage venues in Bangkok. 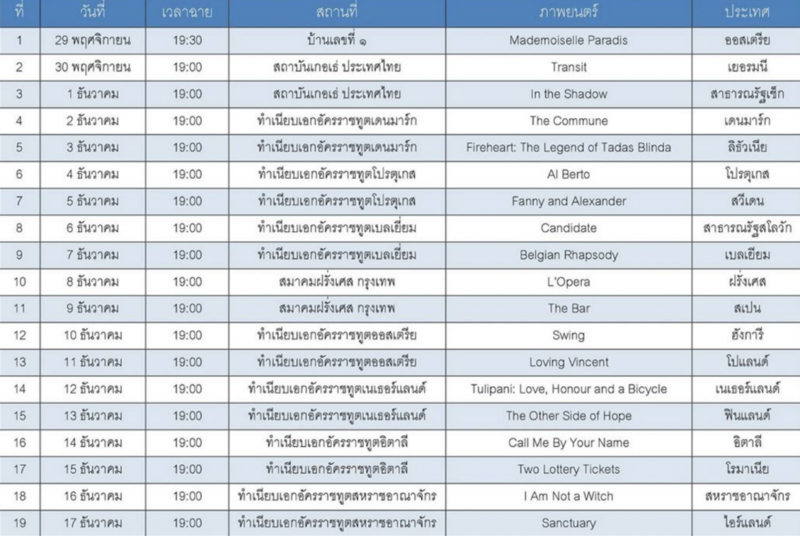 All movies will be shown in soundtrack with Thai and English subtitles. Admission to all film screenings is free. However, pre-registration is required for entry to each film screening. More details can be found via EU Facebook Event Page or contact Khun Wethita Layamanuman at Tel: 02-305 2687. Seats are limited and will be allocated on a first come, first served basis. The European Union (EU) is composed of 28 Member State who have decided to gradually link together their know-how, resources and destinies. Over the past 60 years, they have joined forces to build a strong political union of stability, democracy and sustainable development whilst maintaining cultural diversity, tolerance and individual freedoms. At the same time, the EU has developed into a global actor committed to sharing its achievements and values with countries and peoples beyond its borders.